Acorn Health is an innovative, family run healthcare clinic in the heart of Emsworth owned and run by Philippa Oakley, Doctor of Chiropractic. Our focus is on helping you and your family to lead a healthier, happier life. You deserve the very best healthcare available, and we believe a team approach is vital to meet your healthcare needs. You’ll be treated as an individual, listened to and respected every step of the way at Acorn Health. We are easily accessable from Havant, Chichester, Waterloovile, Southsea and Portsmouth via car and public transport. The World Health Organisation defines health as “a state of complete physical, mental, and social well-being and not merely the absence of disease or infirmity” and in recognition of this, we take a multidisciplinary approach to managing healthcare. Our team of experienced, professional practitioners offer a range of therapies which promote true physical, mental and social wellbeing. Our aim is to care for all your healthcare needs under one roof. We know choosing the right healthcare practitioner for you may be confusing. With this in mind, we endeavour to provide as much information on individual therapies within our website. We hope you’ll choose us to look after your and your family’s health. If you have any questions please contact us here or book online using the button below. The saying goes, “Mighty oaks from little acorns grow”, and that is certainly true for Acorn Health. Established in Emsworth in 2014, we expanded to our new premises on Palmers Road in January 2017. We hold two national awards from the Royal College of Chiropractors which we have been presented with every year since we opened. 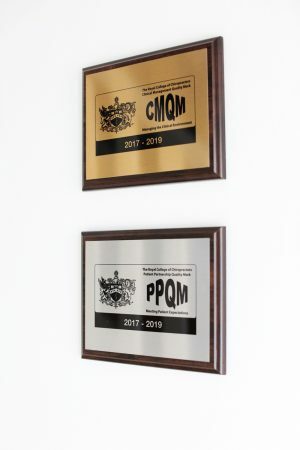 This makes us one of less than 50 clinics in the UK to hold these two awards, recoginising our clinical excellence and commitment to developing a partnership with you, our patients. We are committed to continually improving the level of care and service we provide to you, in addition to increasing the range of healthcare therapies we have available. We always aim to meet and exceed your expectations when seeking care with us, ensuring you receive the level of healthcare excellence you deserve.